Yesterday, my wife Melissa noticed a problem with our home Internet connection: certain websites, including my own jonschneider.com, would not load. The browser would get past the "looking up..." step (so DNS resolution was working fine), but the website would simply never respond to the HTTP request, and the browser would eventually give a "Network Timeout - The server at [site] is taking too long to respond" error. Did you spot the pattern? (If not, take a closer look at the IP addresses.) Once I started looking at the IP addresses of the working sites versus the non-working sites, it quickly became obvious: Attempts to connect to sites with 64.x.x.x IP addresses were not working, whereas all other sites that I tried worked just fine. I had never heard of an issue like this before. I initially didn't really have a good idea where along the pipeline of [Client PC] - [Router] - [Cable Modem] - [ISP] - [Internet] - [Web Server] the problem was likely to be. It wasn't just http requests that were failing; I couldn't successfully ping, tracert, or connect via ftp to any of the "non-working" sites, either. I was able to successfully connect to some of the sites from work; plus, given that if a site like the google.com homepage had any significant downtime at all it was likely to immediately be big news, and there had been no such news, I was able to rule out the web server as the problem. I was able to reproduce the problem on a couple of different client machines and different web browsers from home, so that (most likely) ruled out the client PC as the issue. My suspicion at this point was some kind of problem at the ISP level; I figured that since I was able to browse some websites with no problem at all, my router and cable modem must be ok. This turned out to be a bad assumption. I had tried "rebooting" the cable modem (by disconnecting the power, waiting a couple of minutes, and then reconnecting) early in the troubleshooting process, but that step had had no effect. Throughout the process, I had assumed my router was ok. However, when I used the router's browser-based administration application to try and perform a release/renew on its Internet IP address, and the application simply stopped responding after the new request, I immediately (and to my chagrin, for the first time) suspected some kind of problem with the router. I cycled the power on the router (unplug, wait briefly, plug back in), and that turned out to be the solution! Immediately, all of the 64.x.x.x sites were working fine once again. I'm still not sure why cycling the power on the router was the solution to the issue, except that to guess that apparently, after weeks (or maybe even months) of uptime, the router had managed to get itself into a bad state, and cycling the power was enough to refresh whatever internal memory the router has back into a good state. Hopefully, this post will be a time saver for anyone else out there who manages to run across this issue -- at least, so long as this blog doesn't get changed to have a 64.x.x.x IP address! :-) I have had various problems with this router -- a Linksys BEFW11S4 Wireless-B that's now over a couple of years old -- before (1, 2, 3). I think it may be time to start keeping my eyes open for a sale, and jump on a deal to replace this router when the right deal presents itself. This post details my Top 8 Windows XP customizations. Some of these may apply to Vista as well; once I have my new machine up and running with Vista for a while, I'll reprise this post and report which of these customizations are still useful under Vista, and which ones are no longer needed. There might also be some new additions to the list; time will tell! Note: Large applications such as Firefox are outside the scope of this list; I'm focusing in here on items that modify the behavior of Windows itself, or are otherwise basic utilities or tools that tweak the way that I use Windows. WindowSpace provides the cool feature of having windows "snap" to the edges of the screen, and to other windows, as you drag or resize windows using the mouse as you normally would. This is nice for taking advantage of the real estate of your screen area; before using WindowSpace, I would typically leave "dead space" between the borders of my non-maximized windows and the edges of my screen, because it was a nuisance to try to position a window exactly against an edge of the screen. Alexander really nailed the feel of how the "snap" behavior works; it feels very natural and intuitive. It also works just fine with multiple monitors. WindowSpace also provides some handy global hotkeys for resizing a window via the keyboard such that it is positioned against a desired edge of the current screen, and for other functionality related to window positioning and sizing, which can be remappend, and enabled or disabled. This is essentially the nice, fast desktop search built into Vista, back-ported to Windows XP. I have had an occasional issue with Windows Search 4 not finding an item that I know is present on my local hard drive (including items that have been around for a while, so it isn't an issue of the Windows Search indexer just not yet having added a newly-created document to its index); but for the most part, this is a great (and free!) improvement over the default local search functionality that ships with Windows XP. Note: Windows Search 4 does by default add a somewhat unsightly, screen-real-estate-consuming search field to the Windows Taskbar; I posted previously about how to hide the search field. I use the Win+F ("find") shortcut key to bring up Windows Search when I need it. Rather than a utility or functionality enhancement, this just plain makes Windows XP look cooler. This Black (or "Zune") style gives you another alternative to the default blue XP style (and the built-in silver and olive alternative styles) and the gray "classic" style. It was apparently developed by Microsoft to promote their Zune portable media player (hence the name). Even if you're not a Zune fan (I'm not a Zune owner, myself), this black style makes Windows XP look a lot sharper. ClipPath adds an option to the right-click menu of Windows Explorer when a file or folder is clicked: "Clip Path" (to the clipboard). This is very useful to essentially get a reference to a filesystem file on the clipboard, which you can then paste directly into the "File | Open" dialog of another application (rather than using the dialog's GUI to drill all the way back through the filesystem to the file's location). I previously discussed ClipPath in a Utility of the Day post. Better support for many (22 or more) open applications. Ditto enhances the Windows clipboard such that when an item is placed on the clipboard, whatever was on the clipboard previously isn't lost, but is instead saved into a persistent storage area. A global Ditto Paste hotkey (I use Ctrl+Alt+V) can be set up to bring up Ditto's paste interface, which allows you to quickly paste an item that was stored to the clipboard recently, or even to do a search on older clipboard items and paste one of those. I didn't use Ditto heavily right after I installed it, but I've found that over time, I've come to rely on and take advantage of the productivity benefits of old clipboard items not being erased when something new gets saved to the clipboad. I previously posted about Ditto in a Utility of the Day post. I originally downloaded this utility for one reason: I wanted the ability to close applications from the Windows Taskbar by middle-clicking them (just like you can do in Firefox and other tabbed applications); after all, what is the Windows Taskbar if not a tabbed view of the system's open Windows applications? 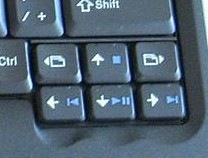 Taskbar Shuffle enables this middle-click-to-close behavior for taskbar tabs. Much easier than doing right-click | Close on many open applications (especially for those applications that put the "Close" option somewhere non-standard on the right-click menu). I've since started also Taskbar Shuffle for its primary purpose: Moving taskbar buttons around on the taskbar via drag-drop. The most obvious use case for this is moving my mail client back to its position at the top-left corner of the taskbar (where I always expect it to be!) after it crashes and I re-open it. Unfortunately, Taskbar Shuffle doesn't currenly support 64-bit versions of Windows. Taskix is an alternative which apparently has very similar functionality to Taskbar Shuffle and does support 64-bit Windows (including Vista), but I haven't tried it out yet myself. Update 7/1/2009: A 64-bit version is now available! Nice! Go check it out. I previously covered Taskbar Shuffle in a Utility of the Day post. PureText does just one thing, and does it very well: It sets up a global hotkey for "Paste unformatted text." It takes the text that you previously copied to the clipboard and pastes it into the current application, but without any rich text markup that might be stored in the clipboard along with the text. Paste some code from Visual Studio or Eclipse into MS Word, without getting the font and background color from the IDE. Paste text from Word into another document (such as an email, a Powerpoint presentation slide, or a cell in an Excel sheet) in the current font of the target document, instead of the font from the Word document. PureText allows you to assign the hotkey that will be used for this operation. I use the default of Win+V. The net result of the operation is like pasting the text into a plain notepad.exe window, and then re-copying and pasting it from Notepad into the target document; or like the MS Office menu option Edit | Paste Special | As Unformatted Text; but in a single, easy, step. Also, unlike the MS Office solution, PureText works regardless of the target application of the Paste is. In my experience with these utilities, each of them has been rock-solid stable. I place a premium on stability of my system, and have had nothing but good experiences with each one of these customizations. I've recently noticed that not all applications handle double-click-selection of words that contain an underscore character (the character "_"; also called "underbar") in the same way. Such words are frequently used by software developers for naming such things as variables and database fields; examples are max_records and customer_id. Since typical (non-developer) users are seldom or never going to be working with documents with words that include underscore characters (and therefore aren't affected one way or another by what the behavior is), I think that the default behavior across all applications should be to select the entire word when a word including an underscore character is double-clicked. The underscore should not be treated as a word separator character for the purposes of an application's logic that selects a word on a double-click. It still might make sense for underscore characters to be treated as word separator characters in some other cases. Such cases might include an application's spell check logic; another case might be the handling of navigating through a document a word at a time via the Ctrl+LeftArrow and Ctrl+RightArrow shortcut keys. Developers of this latter set of applications: If you agree, please go forth and effect positive change! :-) Developers of new applications, please keep this issue in mind when coding up the mouse click UI behavior for your new app. Update 4/4/2011: There is an existing, long-standing (March 2003) Mozilla (Firefox) Bugzilla ticket for this: Bug 196175 - underscore should be part of word, not punctuation. As discussed in that comments on that ticket, though, it isn't clear that special-case logic should be added for the underscore character, since behavior from application to application even on a single platform is inconsistent (as I noted above for Windows applications). I voted for the ticket, but I'm not going to hold my breath at this point for it to be addressed soon! At work, our internal corporate standard IM client is Groupwise Messenger. Today, the "Add Contact" function stopped working for me (after always having had it work fine in the past): When trying to add a new contact, the "Search Results" window would appear with its normal animated "searching..." icon, and then after 30 seconds, the search would time out with the error message "The server is not responding." Despite the error message, I could view the online/offline status of my existing contacts with no problem (so I clearly had a working connection to the Groupwise server). On the Find dialog (where you enter the name of the contact to find), tucked away in the top-right corner of the dialog is an "Advanced" button. Clicking that button restyles the dialog with some additional "advanced" fields. Performing the search while the Find dialog is in this Advanced mode causes the search to work correctly, and the "The server is not responding" error does not occur. This workaround seems kind of bizarre to me -- I have no idea why it works, or what the cause of the initial issue is. Still, I have successfully reproduced this workaround as a solution for the issue multiple times (and gone back to Basic mode in the Find dialog and had the search fail once again as it did originally), so I wanted to share the solution in hopes that it is helpful to someone. where siteName1.com and siteName2.com are the sites that you want to search. For example: Search for "football" at umich.edu and msu.edu. File this one under "so obvious that I couldn't figure it out!" Earlier today, I installed the recently-released Windows Search 4 for Windows XP. I'm going to give it a try not so much as a search tool, but primarily as a means of opening documents more quickly in cases when I already know where the document I want is located, but the location is multiple levels deep in my filesystem hierarchy, and it takes a few seconds to drill all the way down to it; I'm hoping just typing a few characters of the document's name and then opening the document from the search results turns out to be faster. When I installed Windows Search 4, it placed a search bar on my Windows Taskbar. I didn't really want the search bar there; I like to have maximum real estate available on the Taskbar for my open applications' buttons. (I don't have the Quick Launch bar or any other widgets present on my Taskbar, either; I use SlickRun to launch apps quickly using only the keyboard.) I'm also currently running a black Windows theme and a black desktop background, and the bright white rectangle of the search field was a bit of an eyesore. Since I knew that I could also bring up the search field with the global Win+F keyboard shortcut (as Windows Search 4 replaces the default Windows search functionality, including the Win+F shortcut), I poked around in the Windows Search options for a way to hide the search field on the Taskbar. Not seeing any relevant options there, I Googled for an answer, and didn't come up with anything immediately, but eventually found the answer in a reader comment in a downloadsquad.com article comparing Windows Search 4 and Google Desktop 5.5. Commenter "Quikboy" on that article noted that it is possible to hide the Windows Search field on the Taskbar, not from within the Windows Search options, but in the same way that you can hide any other Taskbar widget: Right-click an empty portion of the Taskbar, then on the context menu that appears, open the Toolbars sub-menu, and uncheck Windows Search Deskbar. So, that problem is solved! It remains to be seen how useful Windows Search 4 turns out to be in my everyday work, but at least while I'm making that determination over the next few days, I won't have the search field cluttering up my Taskbar! Fix: Windows Live Writer install: "Sorry, we couldn’t install this program"
I ran into an issue while trying to install Windows Live Writer, a blog-posting package, at work earlier this week. The installer would work for a few minutes, and then fail with the rather uninformative error "Sorry, we couldn't install this program", and offer to put a shortcut to the installer on the desktop for me to "try again later." I did "try again later" a couple of times, but the install kept failing in the same manner. Tonight, I brought my laptop home, and tried the install again, and it worked just fine. I suspect the difference is that here at home, I'm not behind a proxy server. Why the Live Writer installer didn't pick up my proxy settings at work from IE and contact whomever it wanted to contact using those, I'm not sure. For anyone getting this error who is behind a proxy server, though, I would suggest trying the install again from an alternative location that is not behind a proxy server, if you are able to. This post is also doubling as a test post, written and published via Live Writer! Thanks to Scott Hanselman for the recommendation (in this post). This does seem like a very nice tool so far. It appears to support uploading images to a customizable FTP destination separate from your blog host -- hence my image test above -- and if this works out, it will likely replace the custom FTP image resizer/uploader app that I wrote for my wife that she uses when she blogs! I recently picked up a Bluetooth-enabled camera phone, and so I became interested for the first time in getting the Bluetooth functionality on my work laptop (a Thinkpad T60 running Windows XP) working to allow me to easily download pictures from the phone. However, when I launched the Bluetooth Configuration applet from the Control Panel, it would hang for 5 or 10 seconds, and then show an error: "Bluetooth device not found. Please verify that your Bluetooth device is properly connected and turned on." In the Device Manager, under "Bluetooth Devices", only "Bluetooth Bus Enumerator" was listed, but no other specific Bluetooth device. At this point, I was wondering if I didn't actually have Bluetooth hardware installed (despite the presence of a Bluetooth usage indicator icon on the machine); when I first got this machine, the internal wireless card wasn't yet installed, and I needed to take the machine down to the IT department to have them pop it in. However, one of the IT folks I talked to confirmed that the Bluetooth capability should be present in the existing wireless card. The solution turned out to be that Bluetooth was disabled in the BIOS. In the BIOS, in the Network section, there is a setting named Internal Bluetooth Device; the value was set to "Hidden." I changed this to "Enabled," saved, and rebooted, and now the Bluetooth card does show up properly in Device Manager and in the Bluetooth Configuration applet. So, I can now successfully pull photos directly off my camera phone to my PC, without having to individually email them to myself from the phone as picture messages (and pay my wireless provider for the privilege)! Currently, there is a state of affairs at many companies that employ or software programmers or developers is that if a developer wants or needs something to improve their personal productivity -– for example, a new piece of hardware such as a 2nd monitor, or a book on a new software development methodology –- that need is essentially treated as "non-standard" or "out of the ordinary", and requires special approval from a manager. After reading Jeff Atwood's recent blog post We Don't Use Software That Costs Money Here, I got to thinking: Wouldn't it be nice if every developer had a small discretionary budget from their employer of, say, U.S. $300 to go out and buy themselves things they want or need to help do their job better? The developer could just order themselves what they need -- no special approval required -- and then expense it to the company, up to that annual $300 limit. What would the discretionary budget cover? The obligatory development machine upgrade every 3/4/5 years that developers generally need to be able to keep up with modern software. Major software packages that developers require to do their jobs, such as a copy of Visual Studio for developers working in a C# shop. I picked $300 because it's enough to buy a modest amount of items that can make a real productivity impact; say, a decent $200 monitor and a couple of $50 books on development methodology. If a developer needs to spend beyond the $300 limit – say, to buy one more book, or to do something more expensive like attend a conference – they could just get special permission from their manager (as would otherwise be the status quo for any request, without the discretionary budget). A budget amount of much more than $300 – say, $3000 – could be problematic because developers at some point would likely feel like they would rather have some of those budgeted funds go directly to their salary. $300, spread over an entire year, is an amount that is probably low enough for most developers not to feel annoyed that they are losing potential compensation. What are the reasons that an employer of software developers might want to set up a discretionary "productivity budget" for their developers? Productivity. Developers can use the budget to increase their own productivity, which directly translates to a productivity gain for their development team, and in turn, for their employer. Morale. Existing developers are happy because they can (within limits) just order themselves what they need, instead of needing to worry about getting approval from a manager, or that they might be "overstepping their bounds" by making a special request. Recruiting. Recruiting is benefited, as the discretionary budget can be presented as a differentiator to prospective hires. Prospective new employees could see the budget as a sign that the company is in tune with developer's concerns, and that the company's developers are empowered to make their own development-related decisions (rather than having such decisions be made by potentially non-technical management staff). Why might an employer of software developers not want to implement this policy? Budget. If a development manager implements the $300 discretionary budget policy for his team, and there are 10 developers on the team, that's an annual cost of $3000 that needs to come from somewhere. Taken on its own, that figure might initially seem like a somewhat large amount for the manager to approach upper management and request. However, I would argue that the multiple real benefits provided by the discretionary budget (as outlined above) outweigh the relatively insignificant additional cost of the budget as compared to the (most typically) six figures already being spent on the developers' salary and benefit packages. Perception of lost salary. As noted earlier, the potential exists for some developers to be annoyed that the $300 is money that could be going towards an increase in their base salary. However, I think the potential for negative impact stemming from this perception is limited – I suspect there aren't too many developers today who are annoyed that they have such a nice development machine to work with, because their employer could have bought them a weaker machine, and passed the $150 saved along to them! Who owns property purchased with the budget? If a developer buys a monitor or a book with the money from their discretionary budget, who does that item belong to? Who owns the item? The Developer. The developer owning such purchased items, no strings attached, probably isn't a good policy. There would be nothing to stop a developer from buying a new video card and taking it home to exclusively use for playing computer games. The employer wouldn't see any real benefit in that case, and the development budget might as well just be rolled into the developer's salary. The Company. A policy of the employer owning purchased items is a possibility. If the developer leaves the company, the company would retain possession of any items purchased. There could be situations where developers might purchase specialized items, though, which the company wouldn't have any real interest in retaining, such as a left-handed trackball (in the case that there are no other trackball-favoring lefties on the team). The Developer – with a caveat. An employee-friendly approach that blends these ideas would be to allow the developer to have ownership of purchased items, but stipulate that the items are for use at the office only. This would give the company all of the benefits of the developer gaining productivity through use of their purchases; and in the event that the developer leaves, the company wouldn't be out a significant amount of money. This would also mitigate any perception by developers that the discretionary budget funds are coming out of their salary. Whatever ownership policy is chosen, there are cases where exceptions to the general policy would be reasonable; for example, the company might allow developers to purchase a development-related magazine and have it delivered to the developer's home address (rather than to the office), to allow the developer to read the magazine at home in their spare time. What happens to leftover funds at year's end? My suggestion would be that funds left over at the end of the year would not be carried over to the next year; time-limiting the budgeted funds in this manner would encourage developers to use the funds to improve their productivity (per the budget's intention), rather than "hoarding" budget dollars, or alternatively, just ignoring the budget. One potential issue with this approach is that some developers might, at the end of the year, spend their budget on frivolous purchases, just so their funds aren't "lost." One possible way to deal with this might be to give developers a cash award equal to something like 20% of their leftover budget funds. A developer with $100 left over at the end of the year might then be encouraged to not spend their money, to get the extra $20 in their paycheck; but the 20% is a low enough amount that developers probably wouldn't be very motivated to purposely refrain from spending any of their $300 budget throughout the year, with the intent of earning a mere extra $60 at year's end. Certainly, the idea that developers should be given significant latitude to obtain whatever equipment they feel they need to do their jobs, and to have other exceptional on-the-job benefits isn't a new one; good articles on this topic include Joel Spolsky's A Field Guide to Developers and Jeff Atwood's Programmer's Bill of Rights. However, I have observed that companies which aren't among the group of a relatively few "elite" development-centric companies along the lines of Google, Microsoft, Joel's Fog Creek, or Jeff's (until just recently) Vertigo would (and actively do) simply balk at the prospect of the required expenditure and (perceived, at least) questionable ROI of implementing Joel's and Jeff's suggestions. On the other hand, a basic $300-per-developer budget at outlined in this article might be more palatable, and thus realistically more likely to be implemented, at the mainstream of companies that employ developers -- both software-industry companies, and companies in other industries that have developers on staff to develop internal applications. Developers, feel free to present the developer's discretionary budget as described in this article to your manager, and see if you can't get a productivity-enhancing discretionary budget approved for the developers on your team. If anyone does get such a budget implemented at their workplace after reading this article, please do let me know. I would be happy to hear about it! On Windows, it is possible to get into a situation where one or more application windows are positioned entirely outside of the bounds of the viewable area of the monitor. This can sometimes happen with a machine in a multi-monitor setup where one of the monitors is disconnected; an application window that is in the minimized state at the time that a monitor is unplugged can, when the window is restored (un-minimized), be restored to a position somewhere off the screen, in what was the viewable area of the disconnected monitor. Make the off-screen window the active window by clicking on its icon in the Windows Taskbar. Press Alt+Space, and then press the M key. This will activate the window's system menu, and put the window into "move mode." Press any arrow key once. This will put Windows into a mode where moving your mouse will drag the active window around the desktop (even without holding in a mouse button). Move the mouse around until the window reappears on the active monitor. Left-click once with the mouse (anywhere) to exit "move mode." That's it! This works on Windows XP, Windows Vista, and Windows 7. I hope this helps! You can quickly and easily create a .zip file containing the files and subfolders in a particular subdirectory tree in Windows XP by right-clicking the root folder of the subdirectory tree to be compressed in Explorer, and then selecting Send To | Compressed (zipped) Folder from the context menu that appears. Doing this causes Explorer to create a .zip file with the contents of the subdirectory tree (with the same name as the name of the tree's root folder, plus a ".zip" extension), located in the same folder as the subdirectory tree's root folder. The files in the created .zip archive retain their full path information (so that the folder structure of the subdirectory tree will be retained when the archive is later uncompressed). This technique is handy for doing things like compressing the subdirectory tree of a small development project's source code, in order to easily send the code (in the form of the created .zip file) to another machine. The technique is also nice because it doesn't require the use of any 3rd-party tools. Have you ever wanted to know the specific color of something shown on your computer screen? Dropper by Brian Friesen is a lightweight Windows utility that will let you do just that. It will show you the color of any pixel on your screen, regardless of which running application the pixel is located in. One limitation of Dropper is that it is an older application ("older" in this case meaning 2006! ), and doesn't have multi-monitor support; it can only show the color of pixels in the primary monitor on multi-monitor systems. You can download Dropper from its page on Brian's website. In most of today's major operating systems, the built-in clipboard has a significant limitation: it can hold only a single item a time. If you cut or copy a second item onto the clipboard, the first item is gone, with no direct way to recover it. Jeff Atwood posted about this issue recently in more depth on his excellent Coding Horror blog. From the comments on Jeff's post, I learned about an excellent Windows utility that addresses this problem: Ditto. Ditto allows you to use a configurable system-wide hotkey (I'm currently using Ctrl+Alt+v) which brings up a "history browser" with all items that had been recently copied to the clipboard. Ditto automatically takes care of saving clipboard items, so that older items are no longer lost when a new item is copied to the clipboard. (Using Ditto) Paste item 1. Ditto is written in C++, and is free and open-source. You can download it from the Ditto Homepage. C:\temp> copy t.txt " t.txt"
03/06/2008  05:29 PM    <DIR>          . 03/06/2008  05:29 PM    <DIR>          ..
$ cp t.txt " t.txt"
$ cp t.txt "t.txt "
$ cp t.txt " t.txt "
" t.txt"  " t.txt "  "t.txt"  "t.txt "
The fact that filenames can contain leading (and, on Linux/Unix, trailing) space characters seems like a good thing for developers to be aware of. Use caution when writing code that trims leading and trailing whitespace from a string that represents a filename!